Tents are evolving in the way they function and look. The Heimplanet Cave Tent is a bold product exhibiting these principal foundations. Right away we were vividly aware that this tent is serious about speed when it comes to pitching, it wants us to forget about the worry of tedious drawn-out hands-on pitching and relax and have a solid living structure pop up in seconds. We were just recently absolutely blown away by the haste the Vango Velocity 400 Tent displayed with regard to its three/four minute inflatable AirBeam system. Heimplanet Cave is a very different tent to that though, it’s smaller for one thing and rounded in shape. So the pitching process goes like this, remove the Heimplanet Cave from the included carry bag, lay on intended surface and pump up the tent (pump is not included, it should be). Within around 60 seconds we had the tent up, this was astonishing and is the fastest pitch of a tent we've yet to see. If you choose to pitch the guy ropes then that will require a further few seconds. However, we actually didn't pitch the guy ropes whilst using it on one occasion, when placed in a very sheltered area, and the tent was absolutely fine for the night. With the guy ropes pitched the tent had added resilience to the wind, which is especially useful when no one is occupying it helping to weigh it down. It's probably worth noting that the fly sheet and inner tent, which has an attached groundsheet, are two separate entities. We didn't have to assemble them together but that might be because we were handed special treatment. So bear in mind that on the first instance of setting up the tent you might have to attach them together, which could slow down the zippy setup on your first camp. There are many valves scattered along the bottom of the tent. 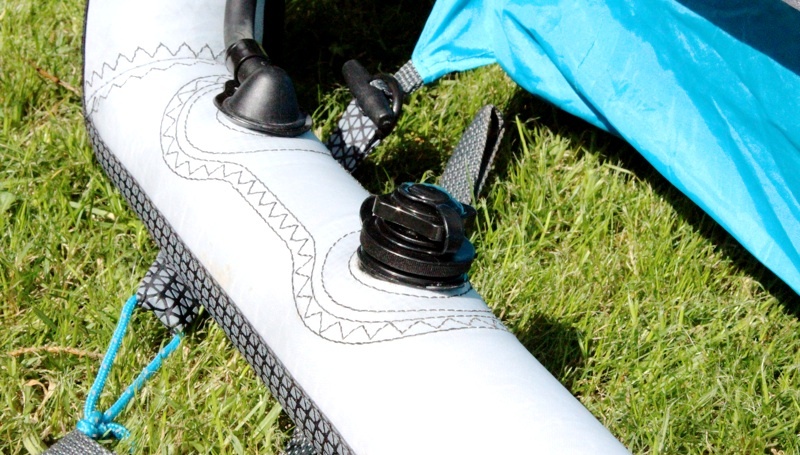 We only had to pump through one valve to erect the entire tent, but all these individual valves played a helpful role with getting the remaining tiny pockets of air out of the separate section of the frame when packing it up using the deflation part of the pump. The air frame is harmonious in appearance but is actually made of five individual sections. So in the event of a puncture, the tent will still remain rigid. 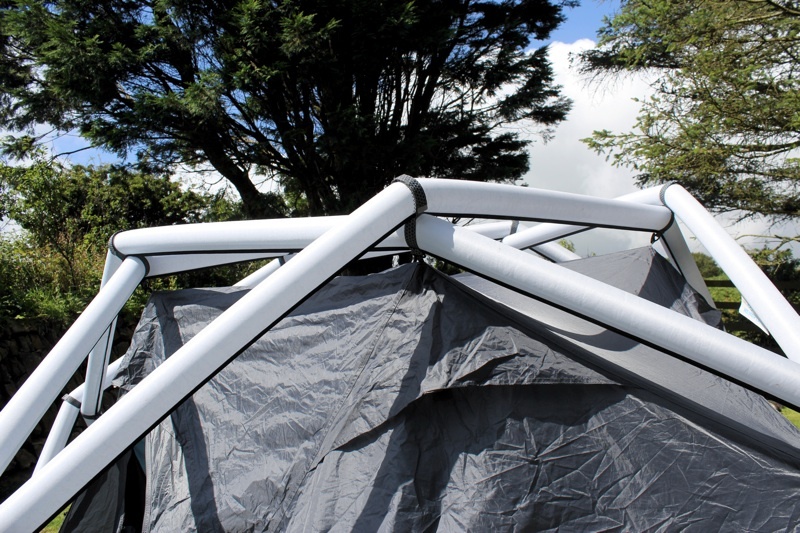 We've been using the Cave in some very heavy storms within the USA and it has really met some grand challenges in terms of rain and winds of 60mph+, but the tent has always come out fine. The 100% Polyester 75D 190T Ripstop, PU 5.000 mm fly sheet gets our seal of approval and so does the 100% Nylon Tafetta 70D 210T, PU 7.000 mm groundsheet. Not one drop of rain entered the tent and we generally felt very secure and confident in the Heimplanet Cave tent. Its entire structure is made up of an air frame which is aligned in diamond shapes and the impression it makes defines striking. It's a product that has an exterior design due to its functionality but this has in turn led to an absolutely awe inspiring spectacle; so in that sense it's very organic and raw. The structure is the most agile we’ve ever seen demonstrated in a tent. The sheer degree and amount of angles the air beams are placed in just wouldn't be practical for leisurely camping with a pole based tent. Imagine having to assemble it, yikes! But regardless of us praising its structure, there is a stigma attached to inflatable tents. Many camping enthusiast pass them up as 'novelties' and 'fads'. We really feel we should express how incredibly beneficial inflation technology is when it's paired with a tent. And for those who still doubt it, answer this question, what is the technology used within those tyres on your vehicle? The convenience and rigidity that we've seen demonstrated has been flawless too, and we believe it's a natural technological evolution for the tent. Even the price has significantly dropped from the RRP. The Heimplanet Cave is a reasonable £367 on amazon.co.uk. So once the Cave was pitched out in the wilderness, we naturally went camping, which did include sleeping in the tent. In all honestly sleeping and shelter are the sole activities that this tent is good for when occupied by three people. It's not a tent you'd spend all day within when accompanied by two others, reading a book and engaging in other activities will feel a tad cramped with this number of individuals. But when alone or with another individual it makes for quite a nice area to reside, with a 5 sqm (54 square feet) ground space and a height of 102 cm (40 inch) from the inner tent. The lightness of the interior blue and white colours emit a great deal of light, even on dull days, within this tent. Sleeping was exceptionally comfortable, with an airy atmosphere due to the breathable 100% 40D 210T Nylon. In the baking heat, the tent remained cool and resisted a stuffy atmosphere? Side pockets and a pocket integrated into the ceiling of the tent help in organising belongings. And the outdoors stays out of the tent with a small sheltered area just outside the main entrance door, which has a seperate door, ideal for placing footwear. The zipped rounded door of the Cave can be left open without the need for the traditional scrunching and tying up, instead the door can be quickly and conveniently tucked out of the way into a pocket. The door also features a mesh net section for keeping insects out of the tent. This also enhances ventilation within the tent. The Heimplanet Cave tent has demonstrated that 1-3 people camping can put the pitching of the tent to the back of their minds. In around one minute we have a firm structure pitched and ready to withstand extreme weather conditions. If this isn't an encouragement to go camping, we don't know what is. It also broadcasts an exceptionally bold exterior design that is the bi-product of the boldly rigid structure.